Ever since my husband and I married, we have lived very far away from our loved ones. Our first move was 1650 miles away. Our second move put us even further away at 2201 miles. Over the years, we have lost both of Edward’s parents, and various members of my family. We have not been able to travel back East as much as we would have liked due to various circumstances. This time of year, however, it is especially important to stay connected. We do that courtesy of “Ma Bell”. If it wasn’t for that little invention, we would not be able to be apart of our family’s lives. Frankly, if it wasn’t for technology, we wouldn’t be a part of our family’s lives. Computers, the internet, email and video chat have been very helpful to keep us up-to-date on the comings and goings of everyone. So while you’re visiting with family and friends over the next few weeks, don’t forget to pick up the phone, or send someone an email who is alone and not able to travel and be with you this holiday season. I’ve written this post for the 12 Days of Christmas Challenge, sponsored by the Casa De Hansen. 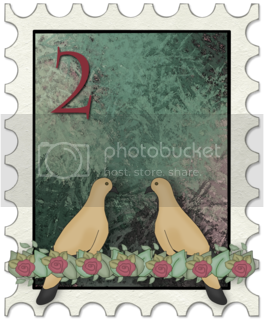 Today’s topic is Loved Ones based on the 2nd Day of Christmas: “Two Turtle Doves” .